A healthy 22-year-old woman presented to the Emergency Department of Aarhus University Hospital with pain after she fell on her right knee. After taking the medical history, a thorough clinical examination was performed. A patellar trauma was suspected and consequently X-ray images of the affected knee were obtained. These included anterior-posterior and lateral views [Figure 1 and 2] as well as a skyline projection [Figure 3]. Figure 1: Anterior-posterior view of the right knee. Neither a fracture nor a dislocation is visible in this projection. The joint spaces and the soft tissues were normal. 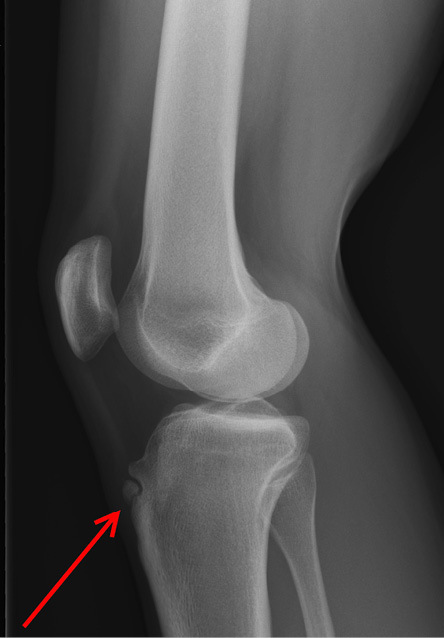 Figure 2: The lateral view of the tibial tuberosity reveals an ununited free ossicle (red arrow). 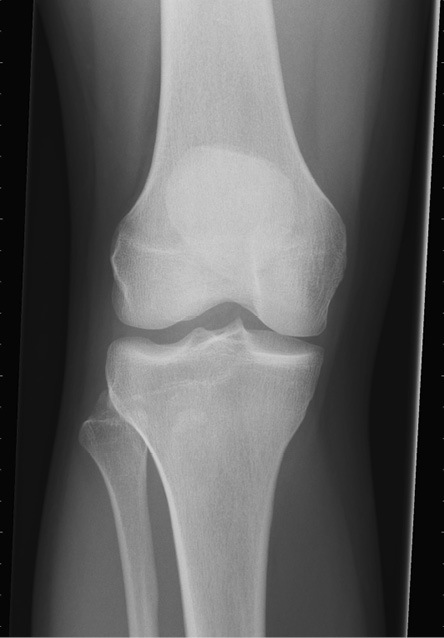 Figure 3: The skyline projection of the right knee does not reveal a patellar displacement or fractures. The patella was well positioned. d.Bone tumor, most likely osteosarcoma. What is the usual initial treatment for this condition? a.Single or repetitive corticosteroid injection. c.Surgical treatment, including removal of the ossicle fragmentation. d.Rest, ice, and nonsteroidal anti-inflammatory drugs. e.Complete reduction in activity for at least one week. Rest, ice, and nonsteroidal anti-inflammatory drugs. It is important to assess for an acute injury due to trauma. While a fracture has to be ruled out, other important differential diagnoses have to be kept in mind. These include subluxation or dislocation of the patella, tibial and patellar apophysitis, patellofemoral pain syndrome, tumor, and infection. 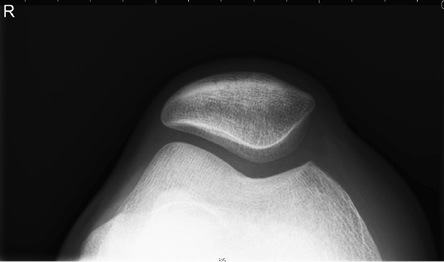 While the anterior-posterior view and the skyline projection of the affected knee show neither signs of a fracture nor a tumor suspected mass, the lateral view of the tibial tuberosity reveals an ununited free ossicle [Figure 2]. In regards to the patients’ age and clinical history, the imaging findings were consistent with OSD. Sinding-Larsen-Johansson-Syndrome is an important differential diagnosis. Like OSD, it is also considered a traction apophysitis, however, affecting the inferior patellar pole. Affected patients often complain about knee pain localized to the inferior patella and radiological findings differ to OSD. Treatment of OSD is usually conservative and involves rest, ice, and nonsteroidal anti-inflammatory drugs. In most cases, patients will respond well to a conservative treatment including application of ice, reduction in activity, and taking nonsteroidal anti-inflammatory drugs.5 Additionally, protective knee padding and physical therapy including low-intensity quadriceps-strengthening exercises are often recommended. Since OSD usually runs a self-limiting course, surgery will only be necessary in a minority of cases. 1. Weiler R, Ingram M, Wolman R. Osgood-Schlatter disease. BMJ 2011 Aug;343:d4534. 2. Maher PJ, Ilgen JS. Osgood-Schlatter disease. BMJ Case Reports [Internet]. 2013 Feb 27 [cited 2016 Aug 23];2013. Available from: http://www.ncbi.nlm.nih.gov/pmc/articles/PMC3603844/. 3. Gholve PA, Scher DM, Khakharia S, Widmann RF, Green DW. Osgood Schlatter syndrome. Curr Opin Pediatr 2007 Feb;19(1):44-50. 4. Kujala UM, Kvist M, Heinonen O. Osgood-Schlatter’s disease in adolescent athletes. Retrospective study of incidence and duration. Am J Sports Med 1985 Jul-Aug;13(4):236-241. 5. Bloom OJ, Mackler L, Barbee J. Clinical inquiries. What is the best treatment for Osgood-Schlatter disease? J Fam Pract 2004 Feb;53(2):153-156.